The July 31 non-waiver trade deadline was an especially active period for the Detroit Tigers franchise, which made big moves both with player and front-office personnel. Detroit traded three of the best players on its 2015 roster in the days and minutes prior to the trade deadline. The team’s biggest move, and arguably the biggest of one of the most active trade-deadline periods ever, was their decision to trade number-one starter David Price to the Toronto Blue Jays. They also sent closer Joakim Soria to Pittsburgh, and, in the final moments before the deadline, Yoenis Cespedes to the Mets. The basic logic behind each of these moves is that, even prior to these trades, each of these players was, for all practical purposes, not going to be a member of the Detroit Tigers in 2016. That’s because each is in the final year of his current contract, meaning that each becomes a free agent at the end of this season. The Tigers would have no special ability to keep Price, Cespedes, or Soria in Detroit after the end of the 2015 season, and, given their individual successes, each is likely to fetch contract offers on the free market too rich even for Mike Ilitch’s blood. Rather than keep Price, Cespedes, and Soria for August and September on a team that’s unlikely to even make the playoffs, only to watch them walk away in the winter, the Tigers, with an eye on the post-2015 future, decided to cash in some of the value of these assets by trading them now. In doing so, Detroit converted these three expiring assets into six prospects, including five pitchers and one infielder. Baseball analysts widely praised these transactions as beneficial to the Tigers, who, general manager Dave Dombrowski announced were “rebooting,” selling with the goal of remaining competitive in the near term, rather than undergoing a full rebuilding. The top return for Detroit was Daniel Norris, a now-former Blue Jay who lives in a van and shaves his beard with an ax. They also received Matt Boyd from Toronto, a younger starter who, in his recent Tigers’ debut, beat Johnny Cueto and the Royals. Of course, the only real question for Detroit was not whom to trade but whether to trade. As July 31 approached, that question divided fans and, it later would be revealed, members of the team’s front office and ownership. As for the former group, most fans recognized the Tigers’ slim playoff odds and supported selling, although a minority that included this writer held out hope that the team could make one more postseason push before initiating a rebuild. Ultimately, Dombrowski’s “rebooting” seemed to satisfy both camps: Detroit would get close-to-ready prospects in exchange for their expiring assets. No long rebuilding process– a full surrender– was in store, just a quick retooling. Two additional notes in the context of these trades: 1) one week before the trade deadline, Toronto, the biggest buyers, and Detroit, the biggest sellers, sat four and five games out of the last American League wild card position, respectively, and 2) while it isn’t at all likely that Price, Soria, or Cespedes will return to Detroit in the offseason, the effect of an unusual clause in Cespedes’ contract is that the Tigers actually increased whatever chance they have of resigning Cespedes by trading him. As the Tigers and their fans were settling into life without Price, Soria, and Cespedes, and enjoying their first trial run with Norris, who had a strong start on Sunday in Baltimore, unbeknownst to them, even more action was afoot behind the scenes. Avila said the team's intentions were to be buyers at the trade deadline but the decision to be sellers was made "pretty late." "We waited til the last possible day that we felt we could wait to make that transition," Avila said about the team's trade deadline moves. Still, Avila confirmed that owner Mike Ilitch authorized the front office’s trade-deadline transactions, a fact that did not make it much easier to understand why the Tigers cut ties with Dombrowski four days after the deadline. As the dust continues to settle on this tectonic shift in Detroit– Dombrowski must be considered one of the most important and successful members of the Tigers organization in its 115-year history, having quickly converted them from historic losers to perennial contenders in a run that included two World Series berths, four consecutive division titles (it previously took the team sixty-five years to win four division titles) during a 2011-2014 stretch in which no MLB team won more games than Detroit, and some of the most stacked pitching rotations and batting lineups baseball has ever seen– the seemingly decisive decision to “reboot” is cast in a new, equivocal, and more complex light, and it is difficult to escape the conclusion that the source of this institutional turmoil is not a power struggle within the Tigers ownership. Earlier in July, before Dombrowski & co. had publicly committed to a strategy, Michigander Jon Paul Morosi cited sources saying that Mike Ilitch’s son, Chris, had begun to assert a greater influence over the Tigers’ business operations. Chris’ reported influence, together with the family’s focus on the development of a new arena for one of their other assets, the Detroit Red Wings, suggested to Morosi that the Tigers would be sellers at the deadline. The reboot approach could be taken as an indication that Chris’ preference won out. The dismissal of Dombrowski, together with the sudden win-now rhetoric of Avila, could be taken as an indication that Mike does not agree with that approach, and that Dombrowski paid the price for straying from the– i.e., Mike’s– mission. 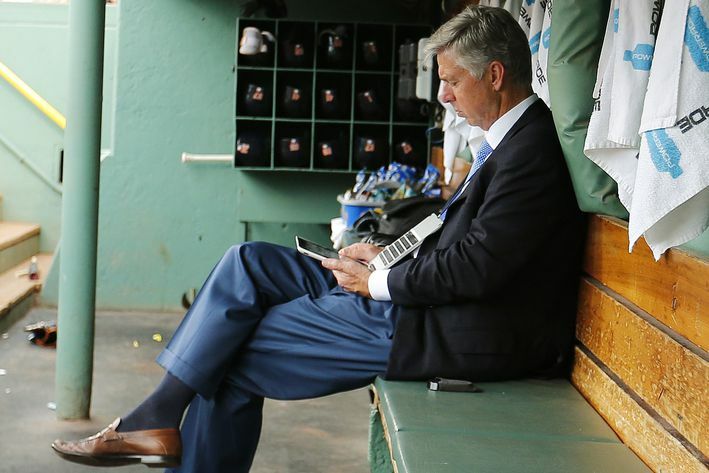 Was Dombrowski a hero or a savior for the Tigers organization? Maybe. But in the end, the circumstances, which were noticeably devoid of a World Series trophy (and, it must be acknowledged, never included a functioning bullpen) proved to be beyond even his control, and Ilitch, who never has made his championship goal a secret, acted as he felt necessary in pursuit of that goal. Whatever occurred over stacks of Little Caesars boxes in Tigers board rooms and conference rooms in the past week or so, going forward, general manager Avila’s assignment is crystal clear: win immediately now; if you’ve already won today, arrange a second game so you can win again as soon as possible; and, whatever you do, do not attempt to win in even the near future if doing so will come at any expense whatsoever of winning today. As Ilitch’s termination of Dombrowski shows, Avila’s assignment comes with narrow margins for error. Even after trading Price, Soria, and Cespedes last month, the Tigers remain, for the moment, exactly where they were a week before the trade deadline: four games out of the second wild card spot. With Miguel Cabrera and Victor Martinez missing significant time due to injury, it’s easy enough to argue that those three were the team’s most important players in 2015 (although J.D. Martinez may want to have a word with you), and without Price starting every fifth game, Cespedes hitting timely home runs, and Soria closing probably more often than he should have to, it’s difficult to see the Tigers making it to the playoffs now, when their odds of doing so were slim even before they made these trades. The Tigers’ future now is unclear. A week ago, it looked as though the team had decided to take a step back from their proverbial championship window. Now, even though they significantly reduced their ability to win games in 2015, Mike Ilitch has shoved them right back into the fray. Although it hasn’t quite materialized in the form of a World Series ring, the Dombrowski/win-now era has been very good for the Detroit Tigers. Regardless of whether the team proves able to return to its winning ways in the remainder of the 2015 season, Dombrowski’s final acts on their behalf make it more likely they’ll be able to do so in 2016 and beyond. For that, at least, Tigers fans should be thankful. This entry was posted in ALDLAND and tagged al avila, baseball prospectus, blue jays, chris ilitch, daniel norris, dave dombrowski, detroit, detroit free press, espn, espn the magazine, fox sports, joakim soria, johnny cueto, jon paul morosi, kansas city, matt boyd, mets, mike ilitch, mlb, new york, pirates, pittsburgh, red wings, royals, tigers, toronto, yoenis cespedes by AD. Bookmark the permalink.